Organisers British Cycling have put on HSBC Let’s Ride events across the country and this is the second in Coventry. 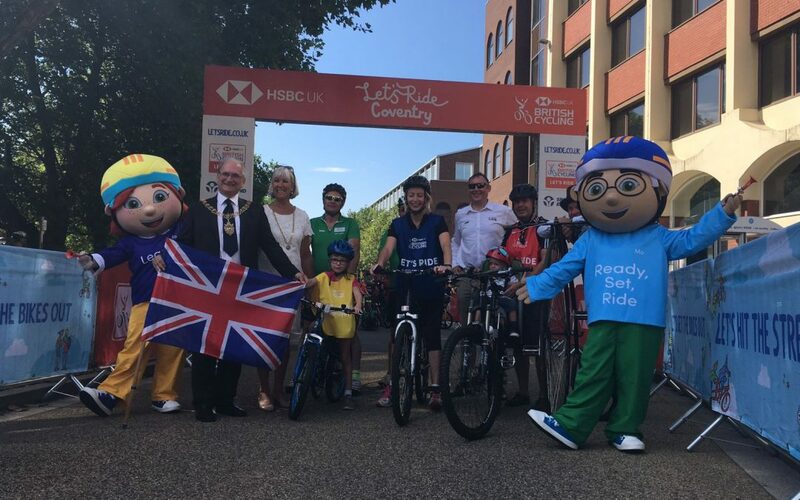 Thousands of keen cyclists have pedaled through Coventry to take part in British Cycling’s HSBC Let’s Ride event. A traffic free ring road – in one direction at least – and a scenic tour of historic Coventry had the city’s cyclists pedalling their way to a relaxing ride. There were competitions for youngsters in Millennium Place and on Broadgate, with pedal powered smoothies, water mills and power banks. Stunt mountain bikers were showing off their skills by the Transport Museum and there were bike mechanics on hand for free safety checks. Organisers British Cycling, based in Manchester, have put on HSBC Let’s Ride events across the nation, and these will continue in other locations, including Leicester and Liverpool, into September. Where did the cycle tour go? Let’s Ride participants were given a bib to wear out on the route, and left from Broadgate, down Greyfriars Lane, to the start line on Little Park Street. Once the grand depárt had started, cyclists went from the High Street through Coventry’s historic quarter, along Bayley Lane and into the Coventry University campus. From there, the groups travelled down Much Park Street to join the Ringway, which took them anti-clockwise around the city to return back to Little Park Street and up into the cathedral ruins. There were shorter loops for the tots on bikes, with participants of all ages and abilities coming into Coventry to get involved. Ruth Millar, lead cycling delivery manager for British Cycling, told CoventryLive: “The whole route has been really busy and it’s constant around the city. It’s great to have these places where people can come and find out about their bikes, and the best places to cycle in Coventry. They get inspired – it really feels like the whole city has been taken over for the cycling, the sun’s out, it’s just brilliant. “Coventry has a really nice loop, there is a short route through the city centre and then it goes into the Cathedral ruins, which is a new thing for this year. You get to go inside the ruins, and then it’s lovely through the University Campus, you get the opportunity to ride around the ring road – when do you get to do that ever in Coventry? “If people want to have a blast around for a few kilometres in a traffic free environment, they can enjoy the ring road which is free flowing with bikes. We set up Let’s Ride to inspire more people to get out on bikes and enjoy their cycling, and we have loads of events across the summer so if you go to letsride.co.uk, there are spots to join us across the country in the coming weeks.